The European Commission announced in November its intention that, if the UK leaves the EU without a deal, UK citizens will still be able to travel to the EU for up to 90 days in a 180-day period without needing a visa. Today’s vote of the full European Parliament, in Brussels, is the last stage in approving the necessary legislation. It follows on from the confirmation a few weeks ago that flights will continue to operate, even in a no deal. This means that two of the most important concerns for UK tourists and business travellers visiting the EU have been addressed and will provide a further boost to confidence about travel to the EU after Brexit. While it is encouraging that these issues have been addressed and there is wider Government contingency planning in place in the event the UK leaves the EU without a deal, securing a deal is very much the preferred outcome, and we encourage parliamentarians to explore all options to avoid a no-deal. Cruise Club UK is a independent cruise travel agent established for over 30 years. As a wholly owned independent company we can offer honest and impartial advice with your needs always at heart. By negotiating the best deals with the worlds leading cruise lines, we bring the very best cruise deals to everyone. With over 300 years collective experience working specifically in the cruise holiday sales industry the cruise consultants team at Cruise Club UK are always on hand. Providing expert advice for your next dream cruise holiday and customer service that is second to none. We always endeavor to ensure that things will always run smoothly and efficiently, from the initial booking, right through to when you travel. We served over 15,000 happy passengers last year alone. Mention the word Club and it's "how much is that going to cost me?" Here at Cruise Club UK once you have booked with us you're a member, the best part being it's FREE we don't charge a penny and first time bookers will automatically be entered into our industry leading Loyalty Scheme Bonus Points. It's our way of saying thank you and a nice saving for you. Bonus Points can then be redeemed against future bookings. 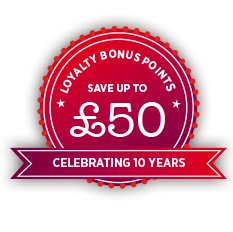 Our Special ‘Double Bonus Points’ events give you even more money off our fantastic offers. We will notify you via email/post prior to these promotions. Bonus points can not be exchanged for monetary value and are not transferable between parties. Bonus points can only be redeemed at the time of booking. Bonus points expire after 3 years from the date of addition to your account if not used. Our helpful and knowledgeable Sales Team will automatically check your Bonus Points Balance at the time of inquiry, offering you further savings off your Cruise. We reward loyalty. For every booking you make with Cruise Club UK, you gain Loyalty Points. Points equal to discount of your holiday. Click here to find out more.